Ask me what a diamond ‘smells’ like, and I’ll have to think about it (and probably spout some easy associations most people wouldn’t challenge — a diamond smells like icy champagne, silk, red roses, ‘gold’…). Ask me what turquoise smells like and I immediately have an idea, not based on the scent of the gemstone but on a place I associate with turquoise: Tibet. Tibetan Buddhist jewelry and religious implements are encrusted with blue turquoise — which can symbolize the sky (infinity), bodies of water, or spiritual transcendence. I’ve not been to Tibet but my imagined Tibet smells ‘cold’ and fresh, with mineral/salt, incense, and floral (think: devotional offerings) aromas thrown in for some heft. Olivier Durbano Turquoise Eau de Parfum* fits into my Tibet-turquoise fantasies. Years ago at the Seattle International Film Festival, I watched The Salt Men of Tibet and was amazed at the dramatic landscape shown in the film, and the high-altitude lakes of Tibet (Lake Namtso is the highest salt water lake in the world). To my nose, Turquoise, the perfume, is a “salty” marine fragrance with detectable lotus blossom, (water)lily, and dry “reed”/straw notes. Mixed with the ‘seascape’ accords are fruity, resinous rose, fumy mineral spirits/turpentine, and mild incense. Turquoise conjures the experience of burning incense at a lakeside shrine (Buddhist pilgrims do burn incense as they walk around sacred Namtso). Turquoise is less incense-y than my favorites in the Durbano line (Black Tourmaline and Rock Crystal), and it’s worth a try for those who like their incense “smoke-less” and sheer. I’ve come to love Turquoise — its salty water/salty skin aromas, its “white” incense, its flowers submerged in ‘turpentine’ and its briny ambergris in the extreme dry-down. Perfume is a “blank canvas” — for me, Turquoise is a Tibetan Buddhist reverie. Make of Turquoise what you will…. Olivier Durbano Turquoise is the perfect summer-sunny incense fragrance; its sillage and persistence are good. Turquoise is available in 100 ml Eau de Parfum ($140); for buying information, see the listing for Olivier Durbano under Perfume Houses. Note: top center image of Tibetan mandala, top far left/far right image of a phurba1 and lower image of Lake Namtso all via Wikimedia Commons. Farther down on the right, the jewelry photo and Olivier Durbano portrait are via the Olivier Durbano website. Wow – you make this sound fabulous, even though your idea of what turquoise evokes and mine are nothing alike. Of course, I spent my teenage years in New Mexico, so turquoise is all about the American Southwest to me – I would imagine it as hot and dusty, with a blindingly blue sky above, the smoke of a peace pipe, and the hint of hot, molten silver floating over the top and maybe a base that is vaguely leather. 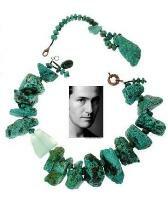 Cynthiaw: I can “smell” that too…I think of New Mexico turquoise as GREEN in color. My take on turquoise matches Cynthia’s – with dry earthiness, wheatened grass and a touch more leather thrown in. alltheprettythins: and if it’s New Mexico: tons of pinon smoke! They’re actually purhba’s, and represent spiritual grounding and “pinning” buddhist teachings to the earth. Be that as it may, I alway am reminded of the “Sacred Dagger of Adjanti” in Eddie Murphy’s “The Golden Child”! norjunma1: outta the loop…have not seen Golden Child or The Shadow! ecliptika…these are NOT meant to pierce flesh. Wow, great review, Kevin! You make me wanna dust off my backpack and buy a ticket to Tibet right now (or, however one gets there — are people even allowed in? lol). I also love Rock Crystal and Black Tourmaline and really admire the line, but I’ve totally forgotten about Tourquoise. Thanks for the reminder. Ojeda: it was released without fanfare…just like the others. Kevin, reading your review take me back to one of my favorite designer, Ralph Lauren Pure Turquoise Perfume. I wonder if this Olivier Durbano Turquoise smells similar. Ooh… I have a bottle of that and haven’t pulled it out in awhile. I’ll have to check it out again and see if I still like it. Suzanne: I’m betting my life: no. Don’t see any Lauren scents as incense-y. I pulled mine out and put it on today – it’s a floral with a woody, patchouli dry down. It’s also much sweeter than I remember, but I’m sure that my tastes have changed dramatically in the last 2 years since I started seriously sniffing fragrance and delving into niche and classics. What a lovely review Kevin. My palms are itching to try this one. I find the the idea of a salty, incensey turquoise (Tibetan incense is wonderful, heady stuff) more appealing than the fresh desert interpretation in something like RL’s Pure Turquoise (thought that one is nice too). norjunma1: I remember the RL Turquoise as very fresh too…but have not smelled it in ages. Nice review, Kevin. I’m happy to see that at least these marine, lotus, and waterlily notes didn’t bore you as many can. This sounds like a sample-worthy fragrance. I love salty-briny notes, and have yet to try anything from Durbano. Your review also evokes the spirit of the L’Artisan travel series. Rictor07: passionate hate, and hate again, and scrubbing… Durbano has invigorated you! Joe: DO try the Durbano line! Quite a few of the scents you review, Kevin, are just not up my alley (Chacun a son gout!) – but I always, always enjoy reading your evocative writing. This review was especially lovely to read – thanks very much for the scent description and the peek at your heart. 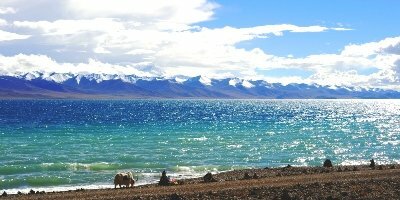 Beautiful picture of Lake Namtso. This is the only one of the line I’ve tried, and while marine scents aren’t a favorite of mine, I do recall finding it more interesting thanks to the metallic-briny aspects. At least if you’re going to do a marine/ozone kind of thing, this is the way to do it. I have to try this. Thank you for the enticing review, Kevin! Sounds up our scent-twin alley, eh? Yup! You and Tama are both right. The good news is that I discovered that I already had ordered a sample. Yay – maybe tomorrow! I have only tried this once and found it too marine but I will try it a couple more times before passing judgment. It seemed like a nicely done marine, but marine nonetheless.